Thursday, November 2, 2017 4:30 PM Robinson Junior High School AWAY 6 Salado High School HOME 6 Game Recap The young Eagles played well last night and earned a 6-6 tie against Robinson. Thursday, November 2, 2017 7:00 PM Robinson Junior High School AWAY 7 Salado High School HOME 0 Game Recap The B team dropped a close hard fought game 7-0. Thursday, November 2, 2017 8:00 PM Robinson Junior High School AWAY 6 Salado High School HOME 13 Game Recap The 8th graders fought hard last night and earned their second district win of the year. The Eagles led at half 6-0 and then scored again in the last quarter to win 13-6. Defense was outstanding. Thursday, October 26, 2017 5:00 PM Mexia Junior High School AWAY 6 Salado High School HOME 7 Game Recap The Eagles won their second straight district game tonight at Eagle Field 7-6 over Mexia. 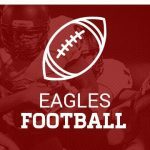 The JV Eagles lost in Fairfield 28-0. The team will be back in action next Thursday in Salado.